furniture available, my favorite piece for a home office is a basic table. There is plenty of room for my computer and printer and other needed peripherals, a container for small items such as pens, I use book ends to control regularly accessed books, and then neatly place in accessible areas anything else that I often use. My “desk” does occasionally get unruly, but since it is all visible, I am forced to tidy it up, unlike a desk with drawers where you can keep your unruliness hidden away from visiting eyes. As you start a new business, other than a table, there are only a couple of other pieces of office furniture that is necessary for a home office or small office space rented in town. The first is a shelf. The shelf is needed to keep other office supplies and reference materials, and like the table/desk, everything is visible and ergo, kept neat. The other necessary piece, and probably more important to have before a shelf, is a filing cabinet. With all the different business forms, it is best to keep them organized from the very beginning. This will help keep the state and federal tax commissions happy! I would have to say though, that the one piece of office furniture that you cannot skimp on from the very beginning is a good office chair. Sit in a lot of different style chairs, you may be surprised what you find comfortable, play around with the knobs and buy the chair that fits you best. Find a chair that you can sit in for long periods of time, if not, you will not get your work done and your business may be doomed to fail from the beginning. So I repeat, DO NOT skimp on an office chair, get the one that works best for YOU! It will pay for itself in the long run. Let us naturally assume that you are successful with your budding business, and before long you are moved into a bigger space and have hired a couple of employees. 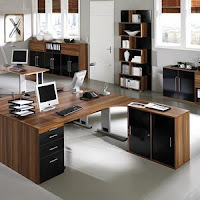 It is now time to get serious about purchasing office furniture. The first thing you want to do is think ahead. What will you need down the road, how do you want your office space to develop as your business grows? If you plan now, you will save money in the future. Modular office furniture is a wonder. You can buy what you need now, but easily add on to it at a later date when your needs have changed or grown. With employees and business meetings you may want to invest in a conference table. Great for weekly planning meetings with employees, it keeps everybody accountable and focused on your business goals. Besides employees, your own needs have changed in the way of office furniture. Perhaps now you have a proper desk with a hutch on one side and extra work space on the other. You have a nice and comfortable guest chair for visiting business men and vendors. You want your office to look nice. There are extra touches with nice prints on the wall, classy lamps and lighting that add a nice ambient feeling to the room, and perhaps a nice coat rack by the door. Yes, you have come a long way since you started your business, and just one place it is reflected is in your office furniture. Gone is the second hand filing cabinet and shelf, replaced by quality furniture that reflects who your are and makes a statement about your business. But lets face it, you couldn’t get rid of your first “desk”. The table still sits in the corner, a great work surface for various projects around the office. You glance at it often, it as a fond reminder of how you got started. Absolutely agree with you about a good office chair. If you're in that chair for 8-9 hours a day, then there's no reason you should shortchange yourself on a comfortable seat. Comfort and back support are so important. If you want to see a wide range of chairs and other office furniture, check out Shoplet.com. Great selection, discount prices. My office was very plain and uninteresting. As we got bigger and needed more furniture and fixtures, we took on more of a modern design look. We always get compliments from our clients, and it is all thanks to our new business office furniture. Not to mention the lovely employees of course.